AMZScout is happy to announce that we have improved our algorithm that predicts and calculates sales for our AMZ Pro Extension! Our previous sales estimation was extremely accurate when comparing it to similar tools, but we wanted to take it up a notch! 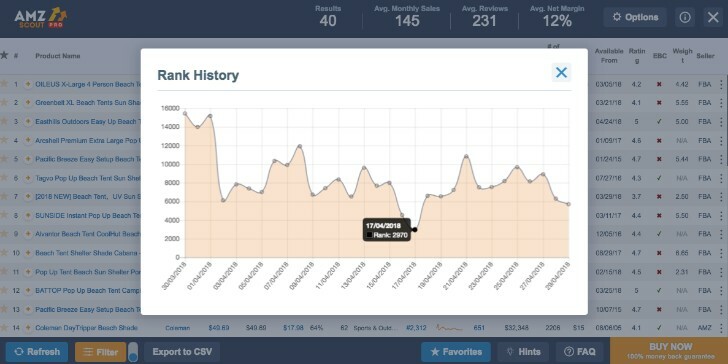 The old algorithm now powers sales estimation for the Basic version of the AMZScout extension. To learn more about the older algorithm, check out this video or article! Every Amazon product has a sales rank. The Best sellers rank (BSR) is a calculation of how well a product is selling compared to other products in the same category. Simply put, it shows how many products are selling better than your own. BSR isn’t just dependant of sales volume. The algorithm calculating BSR also takes other parameters into account. For more information about Amazon’s ranking system, check out this article. BSR of a product is continuously and sometimes dynamically changing. Thus, it’s important to track it. With this in mind, AMZScout presents a new indicator, BSR30, available in the Pro extension for Chrome. BSR30 displays the rank changes over previous 30 days in an easy to read graph. This indicator is the foundation for our newly improved sales estimation algorithm since BSR is the driving force for increasing accuracy for sales estimation. What is Special About the New Algorithm? Amazon does not provide any direct information about sales. But, it shows rank. The algorithm assigns higher ranks to products that are selling well. The product that has the highest sales volume ranks #1. Products with lower sales are ranked accordingly #2… #1000.. and so on. Based on rank, we estimate sales for each product respectively. Then, we calculate sales volume for that day based on our database. This way, we calculate sales for all 30 days. Finally, we sum up these 30 figures to get estimated sales. You can watch video where Alexis will explain more about AMZScout’s newly improved sales estimator. Why AMZScout is the most accurate tool to estimate sales? The new algorithm improved our sales estimation accuracy, making us the best Amazon sales estimator out there. The BSR30 indicator can save a seller from misinformation that can drastically affect his or her decisions. By looking at the current BSR, a seller might be misled to think that a product has sold quite well during the entire month, when in fact, the BSR had just drastically changed in the last few days. Using BSR30, a seller is given a comprehensive map of a product’s past (30 days) without the extreme influence a drastic BSR drop/rise can have on an estimation of Amazon sales numbers. In this example, the rank of the product on 01/04/2018 was 15180. This computes to only about 7 sales per day (210 sales per month). We can see that on 17/04/2018 its rank improved to 2970, indicating more than 30 sales per day (about 1000 sales per month). The real sales should be somewhere in between these two values. 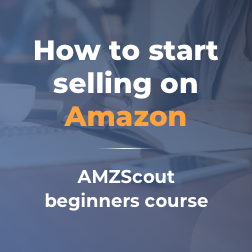 AMZScout estimates it around 400 sales per month. Life is full of unexpected events. But, even in a world full of chaos, there are some things you can predict with some level of accuracy. These predictions help avoid risks. We, at AMZScout, constantly improve our algorithms to provide our customers superior opportunities for growing their business. Our newest algorithm is a product of this mission. Until next time, happy selling!